Our school began in 1949 when members of the congregation saw a need to provide full time Christian education for its children. There were only two teachers and classes were held in the church basement. Grade levels include Pre-K through eighth grade taught by six teachers. Throughout its history, our students have come from neighboring school districts as well as northern Iowa. Our first school building was constructed in 1956. An addition including gymnasium, locker rooms, kitchen, lunchroom, library, media center, office, and storage was added in 1991. Our school is one of 346 Lutheran elementary schools who are operated by congregations of the Wisconsin Evangelical Lutheran Synod (WELS). Approximately 20% of our students are not members of St. John's. We welcome non-members and would love to meet to answer any questions and give a tour of our facilities if parents would like to know more about us. Just contact us at (507) 725-3412 or email us at office@stjohnscal.org. St. John's Ev. Lutheran School admits students of any race, color, national, and ethnic origin to all the rights, privileges, programs, and activities generally accorded or made available to students at the school. It does not discriminate on the basis of race, color, national and ethnic origin in the administration of its educational policies, scholarship and loan programs, admission policies, and athletic and other school-administeredâ€‹ programs. 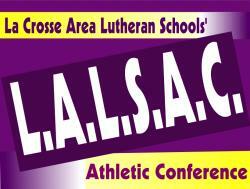 La Crosse Area Lutheran Schools (LALSAC) - Our school is one of fifteen area WELS Pre-K through 8th grade greater La Crosse area schools and an association member of congregations supporting Luther High School in Onalaska, Wisconsin. Go here for school web sites, and more information about member schools. Luther High School Association - St. John's Ev. Lutheran Church is one of 19 La Crosse, Wisconsin, area congregations who make up the Luther High School Association. For more information about Luther's purpose and programs go here. Founded in 1957, Onalaska Luther High School exists to "Provide a Christ-centered education that encourages and equips students for life and for eternity."